The palace of Schloss Mirabell was built under the rule of Prince Archbishop Wolf-Dietrich von Raitenau, the ′father′ of Salzburg′s Baroque architecture. He required a fancy little palace for his mistress Salome Alt. The playful parks and formal gardens around Schloss Mirabell reflect this purpose: Leisure grounds with typically Baroque features such as an orangery, a bird house, follies, a maze, a hedge theatre, patterns of flower beds, and more follies. Luckily, Schloss Mirabell Palace including its parks and gardens are open to the public today. 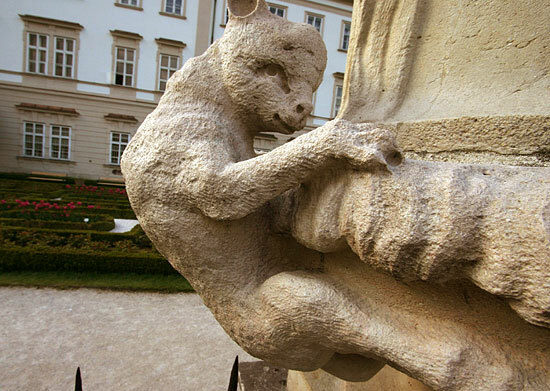 A picture of the same lamb is also included in our Salzburg in winter gallery.